Unfortunately, Renet doesn’t know what’s she’s doing, and the Time Mistress is quickly captured by Chote. Luckily, Renet is able to tell the Time Scepter to disappear before the evil reptile can get his claws on it. The rhyming, arcane rod vows to return later before it teleports away. Meanwhile, Master Splinter keeps watch over Hattori as he tosses and turns in his sleep. Back in the past, the Turtles arrive at Oraga’s stronghold, where they wait impatiently for an audience with the Shogun. After several long hours, Mito announces that Oraga will meet the Turtles in the morning. The guys are not happy about the delay. Chote takes Renet back to his master’s dwelling. The magician is pleased that the woman has been captured, but quite angry that the Time Scepter is missing. The sorceror decrees that the wand will be his in time. The next morning, the Turtles finally meet Oraga, who tells the TMNT that the mysterious sorceror seeks his clans extensive knowledge of mystical things – thus the attacks on the Shogun’s mind. Just as the master finishes his explanation, his mind is once again besieged and he collapses. The Turtles ask for men to assault the sorceror’s keep, but they are refused, as Oraga must be the one to approve this strategy. Raphael grows more and more impatient, but the Green Team resolves to wait for Oraga to recover. Days pass as the Turtles await Oraga’s recovery. Raph spends his time training with two Ronin (masterless Samurai), who are eager to learn Raph’s moves. Leonardo announces that Mito still refuses to let anyone see Master Oraga and Mike and Don decide that it’s time to take matters into their own hands. When the guys ask Raph if he’s heard their plan, the hot headed terrapin announces that they should leave the next day, as he’s busy training with the Ronin. The next morning, the Turtles arise only to find that Raph has already left. The guys head out to catch up with their impetuous brother. We soon see that Raph is accompanied by the two men that he’s been training, Sato and Oshi. The trio discover that the sorceror has burned down his stronghold and moved on. Sato discovers tracks and Raph scrawls an arrow in the ground for Leonardo to follow, before the men head to the caves in search of the evil wizard. Meanwhile, in the caves, the sorceror is castigating Chote for choosing this place as a hideout. The lizard explains that it is a more defensible position. The wizard claims that once he has the Scepter of Time again, no one will be a threat. Renet notes that he said “again” and then asks Chote why he’s serving a creep like this wizard. The reptile explains that he is Samurai, and duty-bound to do so. Raph and his cronies arrive at the cave entrance and head into its murky depths. Chote smells them almost immediately, and his master orders him to attack while he awaits the Scepter’s return. A battle erupts, Sato and Oshi are quickly dispatched by the tough lizard man. 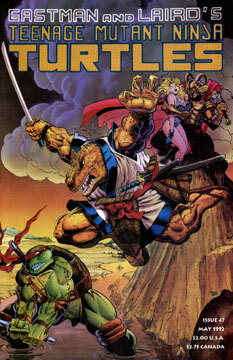 As Raph fights, Leo, Mike and Don arrive and help their brother finish Chote. As the TMNT celebrate their victory, the sorceror arrives, Time Scepter in Hand. After making a dramatic threat, the wizard reveals himself to be none other than Savanti Romero, the demonic sorceror who the TMNT defeated in Tales of the Teenage Mutant Ninja Turtles #7. Savanti explains that rather than being destroyed by an energy blast, he was merely placed in a temporary stasis. When he awoke, he began to make his plans for revenge – plans that included destroying the Gosei clan. Donatello realizes that it’s the Turtles’ own fault for this calamity, as it was their efforts that had trapped Romero in Feudal Japan. Savanti announces that it’s time for the Turtles to die, and he brandishes the Time Scepter. Just then Renet arrives and tells Romero to deal with her, not her friends. The wizard is all too eager to oblige the Time Mistress and uses the Scepter to shoot a bolt of energy at the woman. Renet raises her arm and the blast reflects harmlessly off of her hand, right back into Savanti Romero’s chest – dissolving the villain. The Time Scepter than floats back to Renet and she reveals that she and the wand have worked out alot of their own tricks, this being but one of them. Together they form a great team – just like the Turtles. Chote awakens and Renet tells him that this time is not meant for him, but she will send him to a place where he can begin a new life. The lizard is grateful for the opportunity, and Renet uses the Scepter to send him on his way. The Time Mistress then gives the Turtles a hug goodbye and ships them back to their own place and time. Upon their arrival, Master splinter explains that Hattori has fully recovered. We discover that Savanti Romero was sent backwards in time, unknown millions of years, to live among the dinosaurs. Chote was sent to another galaxy, where fantastic creatures roam a futuristic landscape. Back in Feudal Japan, we see Sato and Oshi leaving the cave where they were knocked unconscious. As the two men walk, Oshi announces that Raphael’s teachings have given their lives new meaning. The two of them must now learn all that they can about the secret arts of Ninja.